notes marbled white vinyl, similar to the white-green vinyl official release. 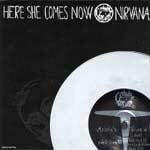 some ebay sellers started to sell it at the end of 2007, listing it as a "repress" or "later edition". 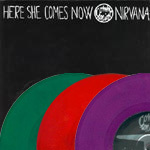 original item: here she comes now - us 7"
notes marbled vinyl in different colours. until now, dark green, red and purple have appeared. made in the uk around october 2005.
made by utopia, in australia, it can be easily recognized by the different matrix, which is also machine printed, while in the original it's handwritten. 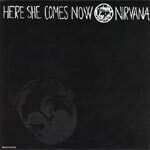 other signs are: a heavier stock of paper used for the three-fold sleeve, which is slightly smaller.